Cambium cnReach N500 450MHz Single Radio with IO - ETSI RED. For outdoor critical infrastructure operations, cnReach transports process monitoring and control data from remote sensors or RTU/PLC's back to the operations center supporting real-time automated decision making and on-going analytics. Covering large geographic areas, hard to reach terrain and challenging spectrum environments, cnReach delivers reliable, secure connectivity to the petrochemical, electric utility, water/wastewater/stormwater and transportation industries. 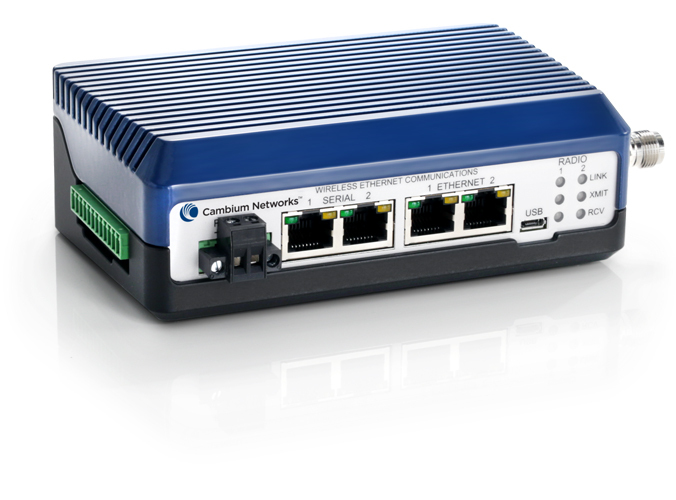 cnReach eases the migration to modern networks by combining legacy serial and analog/digital I/O with TCP/IP and Ethernet connectivity. Fully integrated into a ‘single pane-of-glass’ management platform (cnMaestro™), cnReach helps bridge the IT/OT sides of complex organizations. Combining cnReach’s licensed and unlicensed narrow-band radios with Cambium Networks’ broadband technologies, industrial organizations are delivering end-to-end Industrial Internet of Things solutions today. Extensive I/O capabilities easing the transition from serial to all-IP networks with two serial ports, two Ethernet ports and optional analog/digital I/O built-in. Sophisticated network planning with LINKPlanner, a no-charge planning tool enabling network designers to predict both capacity and availability of networks crossing all of Cambium’s technologies.